C & D Auction Marts Ltd held their fortnightly sale of Calves in Dumfries on Monday 15th April 2019. 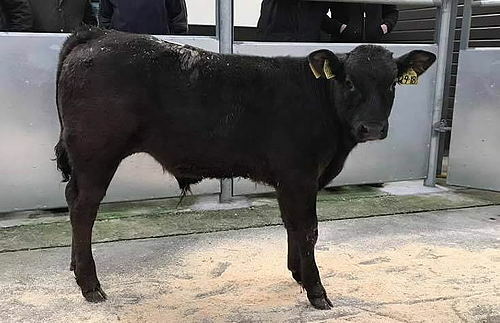 C & D Auction Marts Ltd held their fortnightly sale of Calves in Dumfries on Monday 18th March 2019. A good show of calves presented to a full ring side of buyers. Trade much sharper, more could have been sold to vendors advantage. C & D Auction Marts Ltd held their fortnightly sale of Calves in Dumfries on Monday 4th March 2019. Calves sharper on the week. C & D Auction Marts Ltd held their fortnightly sale of Calves in Dumfries on Monday 18th February 2019. Calves were easily sold to a large attendance of buyers. Limousin to £425 (x2), £420 Ryes, £360 (x2) Barndennoch. C & D Auction Marts Ltd held their fortnightly sale of Calves in Dumfries on Monday 4th February 2019. A fine show of calves presented to the usual ringside of buyers. More calves could have been sold easily. Angus to £310 £300 Barndennoch. C & D Auction Marts Ltd held their fortnightly sale of Calves in Dumfries on Monday 21st January 2019. More calves could have been sold to sellers advanatge. C & D Auction Marts Ltd held their opening sale of calves for 2019 in Dumfries on Monday 7th January 2019. C & D Auction Marts Ltd held their Christmas show and sale of calves in Dumfries on Monday 10th December 2018. The Show was kindly sponsored by Country and Commercial Insurance Brokers. C & D Auction Marts Ltd held their fortnightly sale of calves in Dumfries on Monday 26th November 2018. 68 Forward – Plenty of buyers in attendance although trade more cautious. C & D Auction Marts Ltd held their fortnightly sale of calves in Dumfries on Monday 12th November 2018. 40 Forward – Great show of calves forward to a full ringside of buyers. Limousin to £350 (x3) Barndennoch, £350 Barndennoch, £280 Capelfoot. C & D Auction Marts Ltd held their fortnightly sale of calves in Dumfries on Monday 29th October 2018. 50 Forward – Another large turnout of buyers were in attendance. Trade maintained recent levels. C & D Auction Marts Ltd held their fortnightly sale of calves in Dumfries on Monday 15th October 2018. A good show of 50 Calves forward to a full ringside off buyers, Calves were easier due to high feed costs. Limousin to £460, £390 Ryes, £370 St Ninains Grove, £360 (x5) Barndennoch. British Blue to £360 St Ninians Grove , £275, £250 Woodhead, £255 Townhead. British Blue to £240 Woodhead, £200 (x2) Townhead. C & D Auction Marts Ltd held their fortnightly sale of calves in Dumfries on Monday 1st October 2018. Trade remains bouyant with plenty of demand around ringside. Limousin to £490, £480 Ryes, £395 Barndennoch. Simmental to £490, £475, £380 Whitedyke. C & D Auction Marts Ltd held their fortnightly sale of calves in Dumfries on Monday 17th September 2018. Smaller show of calves forward to a full ringside of active buyers. More calves required to meet demand. Limousin to £430 (x3) Barndennoch, £380 (x4) Barndennoch. C & D Auction Marts Ltd held their fortnightly sale of calves in Dumfries on Monday 3rd September 2018. Smaller show of calves forward to a full ringside of active buyers. More calves could be sold. Limousin to £440 (x2) Barndennoch. Beef Shorthorn to £430, £400, £380 Kirkcarsewell. C & D Auction Marts Ltd held their fortnightly sale of calves in Dumfries on Monday 20th August 2018. 41 Forward: More calves could have been easily sold to an active ringside of buyers. British Blue to £470, £440 Brownfield, £440, £380, £370 (x2) Awhirk. Limousin to £460 (x2),(x4) Barndennoch, £370 Capelfoot. Limousin to £450 (x2) Barndennoch, £350 Capelfoot. Angus to £310 Awhirk, £210 (x2) Woodhead. C & D Auction Marts Ltd held their fortnightly sale of calves in Dumfries on Monday 6th August 2018. C & D Auction Marts Ltd held their fortnightly sale of calves in Dumfries on Monday 23rd July 2018. Due to the continued dry spell and shortage of forage calf trade was easier. Limousin to £420(x6) Barndennoch, £305, £270 Crossdykes. Simmental to £390 Buittle Mains. C & D Auction Marts Ltd held their fortnightly sale of calves in Dumfries on Monday 9th July 2018. Another good show of calves were easily sold to an increasing ringside of buyers. British Blue to £450 Nether Keir. C & D Auction Marts Ltd held their fortnightly sale of 22 calves in Dumfries on Monday 25th June 2018. Another good show of calves with more required. Limousin to £600 (x5), £590 Barndennoch, £325 Kerricks. British Blue to £290 Longrigg. Angus to £200 Kerricks, £180 Landale. Limousin to £490 (x2) Barndennoch. Angus to £280, £230 Kerricks. C & D Auction Marts Ltd held their fortnightly sale of 27 calves in Dumfries on Monday 11th June 2018. A good show of calves were presented to a busy ringside of active buyers. More calves could have been easily sold. C & D Auction Marts Ltd held their fortnightly sale of 20 calves in Dumfries on Monday 28th May 2018. Calves met a grand trade being in big demand. C & D Auction Marts Ltd held their fortnightly sale of calves in Dumfries on Monday 14th May 2018. Trade continues to please with more needed at each sale. C & D Auction Marts Ltd held their fortnightly sale of calves in Dumfries on Monday 30th April 2018. C & D Auction Marts Ltd held their fortnightly sale of calves in Dumfries on Monday 16th April 2018. Trade pleases with plenty of buyers in attendance. Limousin to £515, £510, £500 Ryes, £480 Byeloch. Angus to £460, £455, £440 Ryes.